Name of your data connection as it should be shown in the Applications module. Host or IP address of the Domino server. Port of the DIIOP service on the Domini Server. The port entered here must be open (default port: 63148). Here, you can select an external login stored in the User Manager that should be used for accessing the database. If you do not select an external login then the user account defined below will be used for all calls. Enter the user name here for logging in to the Domino Server. This user account is required for selecting the database and for creating the external data group. Enter the password here (internet password of the user). This value determines how many milliseconds Intrexx will wait for a response from the Domino server. The value -1 will deactivate the timeout. 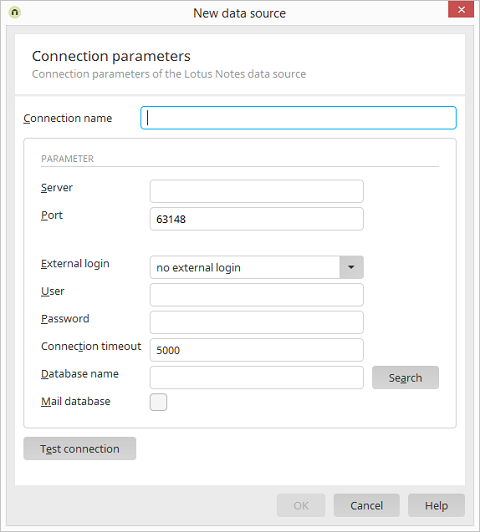 By clicking on "Search", the Lotus database that will be used as data source can be selected. DIIOP must be activated on the Domino server. With this setting the database of the user that you entered in the configuration will be accessed. Click on this button to test whether Intrexx can successfully establish a connection using the data specified (or using the external login). Please note that changes made to an already saved connection are only effective after the portal service has been restarted. When using a Lotus Notes data source, not all Intrexx functions are available. For example, a process cannot access files (embedded objects) in a Notes data source. The search function of an Intrexx application will also not be available in a Notes foreign data group. Which user information is used for which login case? In the following, the user, who is entered in the fields "User" and "Password" in the dialog, is referred to as the technical user. For the different login scenarios, the order that the login data is used in will be specified. The technical user is used. If the login is not successful, an error message is shown. If a technical user has not been specified, the anonymous user is used for the login. The external login is used. If the login is not successful, an error message is shown. If an external login has not been specified, the technical user is used. If the login is not successful, an error message is shown.